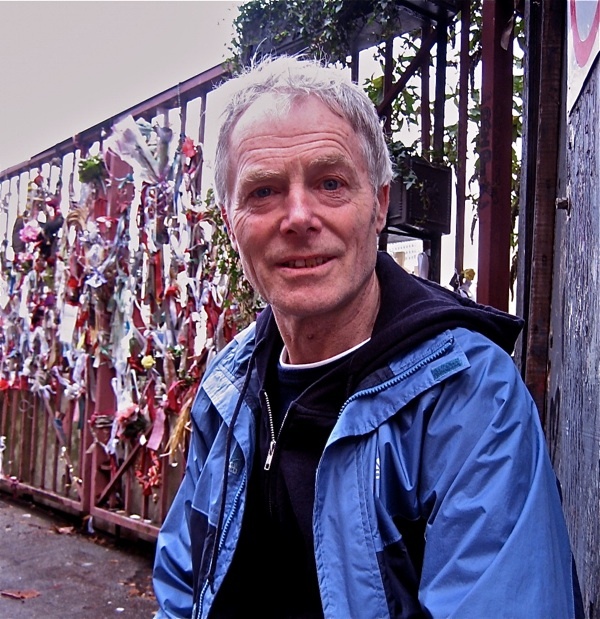 I walked down to the Borough Market yesterday and once I had bought sausages for supper, I turned a corner and walked fifty yards south under a railway bridge down Redcross St to meet John Constable, the poet and urban mystic, at the site of the Crossbones Cemetery. He explained to me that the unconsecrated cemetery originated as a burial-place for prostitutes in medieval times. Thomas a Becket (who was then Archdeacon of Canterbury) signed an ordinance in 1161 permitting the existence of licenced brothels in the Liberty of the Clink beyond the jurisdiction of the City of London, enabling the church to profit from immoral earnings. The prostitutes were affectionately known as the “Winchester Geese” because it was the Bishop of Winchester that issued the licences. As a consequence, Southwark became the destination for all kinds of illicit entertainment and the theatres set up here in Shakespeare’s time to capitalise upon this reputation. John Stow in his “Survey of London” writes in 1598 “single women were forbidden the rites of the church, so long as they continued that sinful life, and were excluded from Christian burial, if they were not reconciled before their death. And therefore there was a plot of ground called the Single Woman’s churchyard, appointed for them far from the parish church.” Recent excavations by the Museum of London revealed an overcrowded site with many bodies showing evidence of disease including smallpox and syphilis – and around a third were babies unborn or less than a week old. A discovery of this nature casts a shadow upon the history of London, exposing the abject human cost of centuries of exploitation. In this story, an unfathomable grief lies buried that we must recognise if we are to truly understand where we have come from and value the lives we lead today in this city. The cemetery was closed in 1853 and it is John Constable (speaking as John Crow) who has drawn attention to the importance of this neglected site in recent times. In his work, Constable takes on the enormous challenge of creating a language to speak about the inhabitants of the cemetery and explore what they have to say to us now. He first came across the site in 1996, while researching his cycle of plays The Southwark Mysteries. “I am a writer who does experimental writing and it led me to a place I never expected” he says. In the winter of 1996, he took friends on walks around the Borough retelling the histories of places that fascinated him. This imaginative obsession climaxed on 23rd November when he returned alone at three in the morning to walk along Redcross St towards the cemetery. “As soon as I entered this street I felt I was walking through the footsteps of those who had been before me”, he confides. It was in this moment of inspiration that he heard the voice of “The Goose”, one of the Winchester Geese buried at the cemetery, speaking the opening line “I was born a Goose of Southwark, by the Grace of Mary Overie…” Along with Constable’s alter ego “John Crow” (who writes doggerel in the tradition of English popular song) he had found the male and female and voices at the core of “The Southwark Mysteries”. Constable has certainly succeeded in capturing the imagination of people, drawing them into the story of the cemetery and bringing them to visit for vigils and acts of remembrance. Nowadays the railings are covered in flowers and ribbons and affectionate messages. And as a result of all this interest, Southwark Council have recognised an imperative to preserve and respect the site with the intention to create a garden of remembrance. I visited out of curiosity for the first time on the night of 23rd November, the anniversary of Constable’s extraordinary vision, and found a group of people gathered at the gates in the dark, led by Constable in rituals of chanting, envisioning and pouring a circle of gin – recalling the primary solace of those buried here. On paper, it sounds pretty daft and I was puzzled to understand what relationship these individuals could have to those who were buried there in unmarked graves so long ago, the outcast dead. “There are people who take this all literally” admits Constable a week later, and I understood that he had been performing as John Crow at the vigil, which was a piece of living theatre drawing everyone together in a shared imaginative moment of connection. Looking back, the irreconcilable grief that is present in the story of the Crossbones cemetery unlocks a passion to connect with the past and those who came before us. Looking forward, the site and the community initiatives to protect it create a inspiring context for people to connect today. Among the relentless redevelopment of Southwark, the Crossbones cemetery proposes a quiet place to meet, recall those who have been forgotten and to recognise our common humanity. I visited the Cross Bones Graveyard on Saturday with my daughter, we both found it moving, sad and strangely atmospheric. 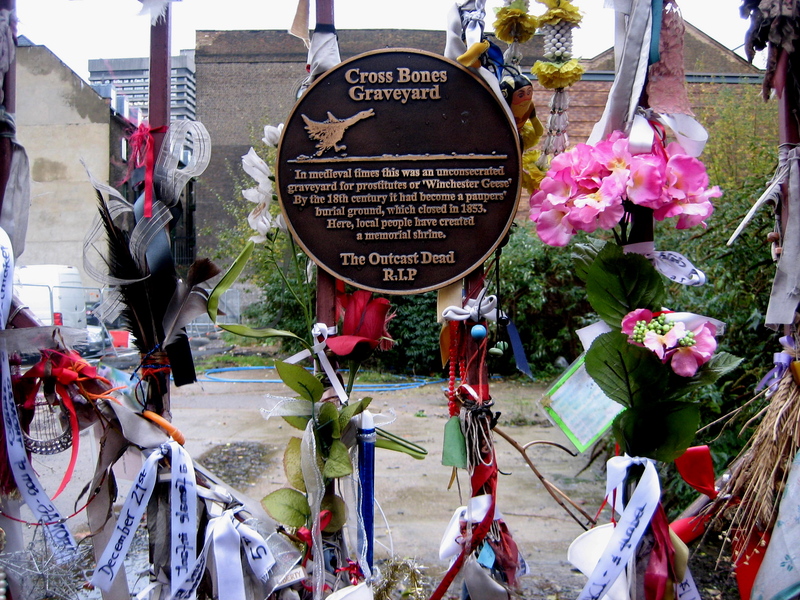 As a former londoner born and bred I met up with an old school friend of 45 years who showed me the cross bones cemetery I never knew of its existance, , I found it deeply moving and sad. as I looked at the messages and flowers left undisturbed at the entrance. Regardless of the fact these people were eiher paupers or prostitutes they were human beings and deserve to be remembered. This site of great significance deserves a pioneer like John Constable to highlight and hold discourse on its enormous effect on the history of Southwark.If anyone feels like going to a vigil on the 23rd of every month don’t be put off by thinking it’s a religious occasion,it is more a coming together of minds and hearts and all are welcome. Crossbones Cemetery is a wonderful place and it connects us to people in the past who were outcasts from society. It is also a source of strength to people in the present who are outcasts. And that is the real point of John’s work. There’s no point in remembering the dispossessed of past times unless you think about those people who are dispossessed now.